It is a common shrub, commonly in arid plains, grow to 1.5-3 m tall, stem is ashy-grey, branches are velvety. Leaves are arranged opposite, shape ovate to rhomboid-ovate, up to 5 cm long, and 3 cm broad, margin entire to wavy-toothed, pointed to blunt. Leaf-stalks are up to 2.5 cm long. Flowers are pale yellowish, 1.5 cm across, stalks are 5-10 mm long. Root is bitter tonic and given in convalescence of measles. 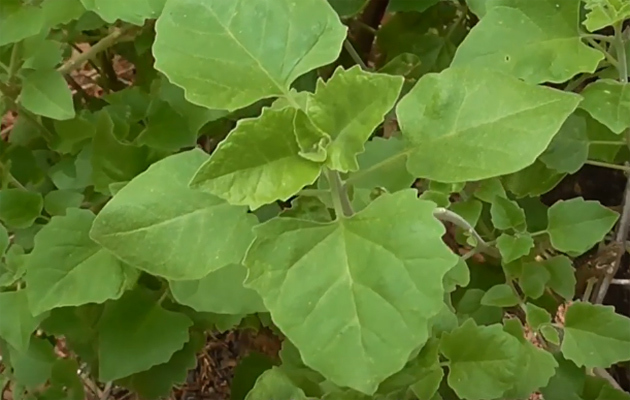 The leaves juice of this plant is alternative and given in neglected syphilitic problems. The root is given as a demulcent in gonorrhoea. The decoction of the plant is considered as a solution to cure stomach disorders and swellings in cattle. flavonoid, glycosides, pectolinaringenin, andrographolide , D-glucopyranoside.